Today is the last day of the Ghacks Christmas Giveaway. We were able to hand out lots of licenses to popular commercial software programs to our readers. The application for today is ESET NOD32 Antivirus, a antivirus software by the Slovakian company ESET. NOD32 is offered as a 32-bit and 64-bit edition for Windows 2000, Windows XP and Windows Vista. Installation is pretty straightforward and comes more or less with the usual choices. It is a little bit surprising (positive that is) that no reboot is required after installation. NOD32 will place its icon in the Windows System Tray and the first thing the user should do is to right-click it and select Update from the options provided. This ensures that NOD32 will download the latest virus definitions from a company server. The interface of NOD32 comes with two display modes. Standard mode is the default mode of the security software which will hide options in the interface from the user. Advanced mode can be enabled to display all options in the interface. One example would be access to logs which is only visible when advanced mode is activated. One interesting aspect of the interface of NOD32 is the possibility to switch menus while scanning. Most antivirus software applications do not permit this and block any attempts to switch menus during scans. Antivirus software has to do well both performance- and detection-wise. It is beyond of the scope of this article to evaluate the capabilities of NOD32 but there are a few independent organizations that regularly test security software. NOD32 is usually ranking very well on tests performed by sites like AV-Comparatives or CheckVir. Those tests suggest that NOD32 has a low false positive rate, a good detection rate (both signature and heuristic) and a fast scanning engine. ESET is proving an online scanner based on the NOD32 antivirus engine on the Internet which is unfortunately only compatible with Microsoft Internet Explorer. We have five licenses for ESET NOD32 Antivirus. If you want one leave a comment and let us know what you use to protect your computer system. Hope I will have a licence for this wonderfull antivirus. I’m currently using a time limited version & it seems this one is the best. would like to have a licence please :). I used in the pas Avast but it seems with the trial version I’m currently testing that Nod is much lighter and less ressources consuming. I would really like a Licensed copy of this product. I currently used Avira Antivir Personal. Hi. Currently use trial version of great NOD32. Wow, nice prize! Count me in. I use it at work on a Windows 2003 server. NOD32 is a great antivirus. The installation is very simple, and it does its work pretty well. I very need this lisense for my computer. Thanks for ur info. Currently using a NOD32 trial – at the moment I basically just change AV between the top few depending on what 3 month keys/promotions the various tech blogs stumble across. I was using Avira before switching this time..
At the moment I don’t have any protection for my pc. So I would love to have this light weight antivirus program. Wow! At the moment I’m using Dr.Web for a few years.Subscription will end at the beginning of next year. Would be nice to get this great AV. On the moment i am using ZoneAlarm Security suite but i realy want to give ESET Nod32 a try. This because ESET Nod32 looks like a great product. I currently use kaspersky trial on my pc which is running out in 7 days. I would love to have license for Nod32 because my trial for it already ran out and I find it way lighter and better than Kaspersky. I’d love this if I’m eligible. i use avg free, i’d like to try this one. I’m currently using a trial version of NOD32 antivirus. I am using AntiVir right now. I’ll be glad if I have the chance to get the protection from Nod32 again that used to be my antivirus software.. I have always always wanted NOD32 but couldnt afford it. Am using AVAST antivirus, COMODO firewall, Adaware, malwarebytes and occasional online scanners from Pccillin. I hope I am lucky cos it’s my birthday! Thanks Ghacks for the excellent giveaways. Merry Xmas! My wife has been praising this for many years. Have been using symantec antivirus that came pre installed with my Laptop, but would love a legit copy of this popular and effective antivirus. Thanks Ghacks! I am currently using AVG. Have tried a trial of NOD32 and was very impressed. COunt me in for a copy. Would like to try Nod32. Currently using AVG Anti-Virus Free. That’s the right way to end a Christmas Giveaway! Please Santa could you chose me for this license? Tried this one, looks good. I love your blog and it helped me many times and i like eset as well, i hope i will win one Happy Holidays ! wow one of my fav av software. its very light compare to other av. I’ve been using freeware AVs till now (Avira and Avast), but I would like to switch to something more reliable. I’ve heard good stuff about NOD32 and would be great to win a license. I’m using Antivir now, but my license will expire soon. Nod32 was always a top AV product. So many people are using illegal copies (extended trials, even third party update sites) that it is a wander that this product is sill on top. Count me in. Great giveaway. I am using NOD32 on my laptop, always been happy with how quick Eset are to update definition files. I totally rely on it protecting my work laptop but wish I could use it on my home machines, cant afford to purchase another. With it being Christmas and Santa being in an especially good mood, here’s hoping for another license… Merry Christmas and New Year to all..
then, I want to thank Ghacks for the GiveAway campaygn, its awsome! I had NOD32 AV on my personal laptop until last November (it expired) and I had to change it with Avira Antivir (free version). I truly recommend ESET NOD32 AV to everyone, at laest my experience with it was very satsfying, specially in terms of smoothness. Its really an hassle free tool. to sum up: thanks ghacks, and I WANT one licence of ESET NOD32!!! I LOVE this software! Best AV EVER! eset the best .using long time for now. I currently use AVG Free (not really good, some F/Ps too), SpyBot S&D and System Safety Monitor (controls and asks confirmation about processes launched by other processes, DLLs and drivers they use…). But NOD32 would be a GREAT Christmas present!!! Thank you for all these Christmas giveaways you’ve done, and specially for this last one (the best one of them, in my opinion). Of all Christmas giveaways this is the one I’d really love to have. Currently i am using avira free which do not have anti-spyware protection. Will be glad to have this license. Hello, i currently use the old version of NOD32. I’m very interested in the new one. AVG Free here, would love to use NOD32! Hi, I’m currently using Avira Antivir, but my computer is pretty old and the antivirus uses most of the PC resources. I previously tested Nod32 and was amazed by its speed and low resource usage. I’ve been using various free AV solutions (Avast, AVG, Avira), but they all seem to come up short in one area or another. I like this software as it returns less false positives. hope its a good product! Currently using Avast Free Antivirus. Would like a subscription to ESet Nod32 Antivirus for better coverage. What a way to finish the giving. I have followed comments about NOD32 and folks seem quite happy with eth quality, but it has been too spendy for my budget. I am using virus protection offered through SystemSuite 8 and the subscription just expired. Perfect timing to upgrade to a better product!!! hi, i’m using a free antvir product, i’d like to get nod32. one of the best antivir imho. I would love to use Nod32. Normally, I use AVG…but I’ve been less then impressed as of late, as the auto-update capabilites seem really flawed, the scans take FOREVER, and the installation process of AVG is anything but simple. AVG takes forever to install, you can’t run anything else (Like firefox, and yes I understand why) while it installs, which greatly hinders my productivity when trying to tune up a re-image on a machine. Recently I’ve tried using Antivir…which seems to protect ok, but it has annoying twitches of its own. I haven’t tried running a full scan yet, so not sure how quickly it runs. What I do know is that it auto updates well, with the exception of that absolutely obnoxious popup that blocks out everything else on my screen every time the virus libraries are updated. The installation of the software is much quicker and simpler than AVG, which is nice. The only other bad thing I can say about it is that a google search is the easiest way to find the software, because if there is a link on antivir’s homepage for the personal version, I haven’t found it (granted, I didn’t look very hard, but again I saw links for every other product that they make). I would like something like Nod32 as many people trust its capabilities, and also I think it would be nice to have something that didn’t bug the heck out of me all the time, at least for my own machine. I use AVG 8 Free on my PC and I’m trying Avast on my laptop at the moment. SAV in work although that’s being reviewed now. If NOD did educational discounts that would be the front runner! Cracking giveaway to end with btw! I am currently using Kaspersky Antivirus 2009 & I don’t mind trying something new. I have to say that NOD32 must be one of the best AV`s around. Light on resources but not light on protection. I’m in. I currently use Bitdefender. I have used ESET Nod32 Antivirus before and found it to be thorough, configurable, and un-bloated. It has never slowed my systems to a crawl as have other antivirus products. Merry Christmas to all, and may the new year bring you blessings! I’m currently using Avira AntiVir but would welcome a license to NOD32 to check it out. Cool, my Norton will be running out shortly, and I would like to win a NOD32 license. I am in to try my luck in the last chance. Currently using Kaspersky Internet Security. The AV seems solid if a bit hyperactive, the firewall is fairly annoying. I’d love to try NOD32. I’m tired of slow and heavy antiviruses like norton which I’m actually using, once I used the NOD32’s trial for delete some viruses on a friend’s computer and it made a good impression on both of us. I currently don’t run any antivirus, except for the occasional online scan. I do have a router and am careful about what I click on though. I haven’t found an antivirus that I’ve liked enough to take the performance hit on my computer. I’ve tried nod32 in the past though and I’ve always held it in high esteem. A first rate AV – count me in! I would like a license to save Christmas. MaximumPC did a round-up last month on Antivirus and NOD32 got a 9. I currently use AVG and it’s score of 6 was apparent while I was fighting off the trojans on a family member’s machine during a holiday party. I switched from avast to Nod32 trial version a few weeks ago. I love this software. It’s really the best giveaway you had ! Nod32 è il mio av preferito! Liked the bitdefender offer but looks like it is a little heavy??? 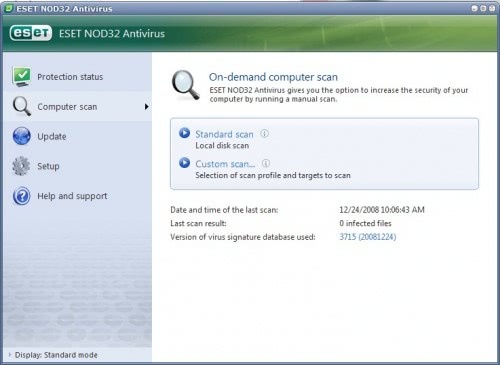 NOD32 has always been a highly rated (and desirable) antivirus solution. Currently using AVG Free and wishing I had the bucks for NOD32. Since I never win anything, I thought I’d take a shot at your giveaway. I check your website daily for news & articles. Keep up the good work! Can really use this, my kaspersky subscription ran out last month and I’ve been running without belt or suspenders ever since! I am using Avira free at the moment. Use Nod 32 before but expired. Would like to use it again! I don’t use anything right now. Only the occasional online scanner courtesy of Trend Micro! Please may I get a license? lol..
I’ve heard great things about Nod32 and would love to check it out. I’ve been using AVG but it doesn’t play nice with my NetFlix plug-in so I need to find an alternative. Thanks and Merry Christmas! I want it, may I get a license please. I have used AVG Free anti-virus for a couple of years. Recently I have had all sorts of problems ranging from it refusing to auto-update (manual updates still work), false positives, quarantine of necessary system files followed by not being able to boot up without restoring those files and just an all-around bad experience. I’ve been trying to decide which AV to use/purchase so I can dump AVG. Everything I’ve read leads me to believe that this would be a replacement! Hello,I use avast home FREE. I could Use this ESET, hope I can win.Nevertheless thanks anyway. Merry XMAS!!! I have nothing but great reviews of NOD32. I would like to switch from NIS2009 but I have never had the opporturnity. I would like to get the chance to switch this year. I use AVG free but maximum pc said that nod32 was excellent. I currently use Avira AntiVir, but would love to use a top notch program like this. Even if I don’t get a licence key, kudos for making the offer. I use NOD32, still have a few months left. i’ll still take a lic. for my other pc or for customers who may want to try it out. I am currently using McAfee VirusScan 12.1 through a program at work where I have the Enterprise edition, which is not too bad. The edition at home is a resource hog and chokes the $@*&! out of my computer when it updates. I’ve heard ESET NOD32 is much gentler on resources; maybe I’ll try it sometime. I’ve juste bought my very first computer and there is AV on it. So i will be happy to win one the 5 licence for this great program. I use mcafee free from school. Won’t be in school forever, though, so I would like a license. thanks! I’m currently using AVG 8.0 Free Edition, but would like to try something that has fewer update issues and false positives. I would love to be able to have this antivirus. I have had mcafee that came with my computer and don’t like it at all! I currently don’t use an AV program and just try to watch what I download/install, but after getting bit last week, I’m considering finally throwing a AV program on, just to be safe. I tend to avoid AV programs due to the hit on system resources, but from what I’ve read, NOD32 is the one of the best AV programs and also one of the least resource intensive. I want to protect my bills, my private pictures of my family, mails and so on! Please gave me one! I also need to try new eset Nod32. Currently, I use old version Nod32 with my 3 years XP notebook and biddefender for vista-PC. NOD32 has fared poorly in recent virus tests!! I would love a NOD32 license. I’m currently using Avira AntiVir. I currently use the free version of avira and super anti spyware free edition. I run a couple different programs to protect me like AVG Anti Virus, Comodo Firewall, Rootkit Revealer, and Super Anti Spyware. Please enter me in this! I use Kaspersky Internet Security 2009. I’d love to try NOD32. Its realXmas And Santa is real!Merry Christmas! I’d love a copy. I currently use no anti-virus program because I haven’t found one I like. I use ZoneAlarm Firewall though. Im currently using the newest version of AVG Free. The watchdog has been pretty good to me until yesterday. Something snuck through and for the last 30+ hours my system has been going haywire with spyware. Ive installed CrapCleaner, Malwarebytes’ Anti-Malware, Malwarebytes’ RogueRemover, Spybot Search&Destroy, Spywareblaster, and SUPERAntiSpyware to remove the problems. The main problems were fixed through the use of these many programs, but Im still getting sporadic popups through a fake Firefox port and I cant seem to locate the little bugger causing the annoyance. I’d love to try this new (to me) antivirus and see it it does any better than AVG Free. I wish you a merryMerry Christmas! I’m currently using AntiVir. I also use Comodo Boclean, Adaware, Windows Defender. I really would love to get a license for ESET NOD32. My platform is Win2003 std SP2. Please send me the free NOD32 license, I’ll really appreciate your help. I use Avira Antivir Premium, Spybot, Windows Defender and the Windows Firewall. Using AVG free at the moment. Hope to win one NOD32 license. I would love ESET NOD32! I would love a license! I use nothing at all. I run naked. I use my quick wit and a readily accessible shutdown button to protect my system. As well as Avast and Spybot. The company I work for used ESET NOD32, but when the license expired they switched to Kaspersky. I suffered through the slowdown, the constant beeping for 3 days, it never got better until I finally uninstalled. I would love to have ESET NOD32 back. have used NOD32 for the last 3 years and it has captured all the Viri that has been flung at it! Licence is due to expire in January 2009 and so a new licence would be fantastic! I would love to win a 32bit license. i use avg and rising which are good programs, but NOD32 should be one of the best antivirus programs. I would really love to try it out. martin, not sure how you decide how to give these out, if it’s the first five–which i initially thought it was–then i and a lot of other folks have no chance. i would really like this one so i’m throwing my name in the hopper against all odds. merry christmas, and continued thanks and appreciation for all your work. Currently i use Avira Antivir Free Edition. I am using currently Norton AV.I would like to try NOD32. I currently run kaspersky, but I would love nod32, as I had it before kaspersky, and I like how its light on resources, and I believe one of the best AV softwares available. Avast Home here mainly cos I’m out of work and it’s free. I used Nod32 a while back and it was the best but couldn’t afford to register it. Currently I use Antivir Free Edition. Before I was happy with my NOD32 from an offer of a computer magazine. Hope to win a new license for NOD32. I am currently using AntiVir free right now. NON32 is best of the best!Merry Christmas! I’m currently using AVG Anti-Virus. Currently i`m using AVG free but i`d like to have a license for NOD32. Lol, I was going to try to get the last prize by saying “Its Christmas where I live!” I but I already have NOD32 lol. But NOD32 has a lot of false-positives on Donation Coders auto-hotkey exe apps. I’m using no real time protection atm. Every few days an online scan, that’s it. I currently use kaspersky 7.x which is supposed to be pretty good but I have had occasional system stability issue with the software. Heard NOD32 is good but have not tried it. I have a 30 day trial of NOD32 and is almost up. Merry Christmas to me! I’ll be happy to have NOD32! I currently use Avira AntiVir Premium. I would love to try NOD32, heard a lot of good things about it. I use AVG Free, and would like to try NOD32. but this would be nice to win. Minimalism is the way to go. I hear Nod32 uses less resources though. I am currently using Norton AV. I would love a license. Thanks & Merry Christmas! I use Avira AntiVir, because as student I have not a lot money to give away for a Anti Virus System. I had in the past a license of NOD32 from a german computer magazin (c’t), it was the best antivirus I ever had. I’m currently using Nod32 version 2.7.
but my 2years license is about to expire. Nod has never let me down.I’d recommend it to everyone! but my license is expiring next week!! I am using Antivir Avira. Can I get one copy of Nod32? I want to try it. I am using avast right now.I think it is really good product.I have heard about NOD 32 but have never tried it.Please let me try this fantastic anti virus. Merry Christmas to all readers!!!!!! I love this antivirus! It’s very low footprint, very efficient, very professional, very good in every aspect I could see. I’m actually using clamwin, but I tried Nod32 very recently and it was really good. I would like a license please. I just built my first comp and am using Windows Vista Ultimate 64-Bit. Thanks and Happy Holidays! NOD32 is definitely one of the best antivirus apps out there. It’s light weight, runs fast, and comes in both 32 & 64-bit! I’d love a copy. I’m currently using Avira AntiVir free and Commodo Firewall free. These have both been good to me and I recommend them to any who wants good PC security for free or who just can’t afford to pay for software, I’ve used them together for a while and have had no big security issues, but NOD 32 in my opinion is probably the best Anti-Virus software out today. I have friends and colleagues that use NOD 32 and swear by it and I would really like to use it myself. If paying for software is not a problem then definately check out NOD 32. Merry Christmas!! Merry Christmas!I wish you aMerry Christmas! I hope that I receive NOD32 from you. I currently am using Avira. Unfortunately I get many false positives in the last time. I hope I win a NOD32 license, so I can compare the two. Thank you and very Christmas days and a very good new year! I hope i get lucky. Would really love Eset Nod32. I curently use mcafee. I like to try NOD32. count me in for this one as well, really need a good anti virus! I am currently using Avira Free. I have used just about everything out there at one time or another from Norton and McAfee to AVG and avast. NOD32 is about the only vendor I have not tried, and it’s reputation makes it an attractive choice. Using NOD32 and i would like that to continue with this offer. I currently use AVG Free. Use NOD32 on my desktop and think it’s the best AV I’ve tried (and that’s a lot). Would love a license for my laptop. please add me in, very eager to test it the paid version as normaly the free version is very limited in function, at the momemat I am using avira free edition. Hi! i use Nod32 :) – my license just expired, i could realy use this. Merry Xmas to all! I used AVG. But id like to use Nod32. I would love the chance to win this subscription to NOD32. I’m currently running Kaspersky/Nod32 beta(only 3 months left!). May I have a license for NOD32 please? It’s a good AV. I hope i win a NOD32 license. I use avira free, efficent and free but used to have nod32 at work, great AV, but last in last AV comparatives analysis didn’t shine as usually did. If a licence is still avaible grant me one please. Now using Avast, have wanted to try Node32, Thanks for the free version. I’m using a free antivirus – Avast. Beside that, from time to time I scan with some free online scanners to be sure. And well, I never had any opportunity to use anything more than just ‘free antyvir’. I’m tired with Avast, but truly there is no other option. So, that’s why I would like to have this license for NOD32 which you are giving out. I am currently using Antivir free from Avira and would like to upgrade to NOD32. Thanks ! would really like a Licensed copy of this product. Would appreciate Nod 32. Am currently using AVG Free. I would to! Merry Christmas! eset is no.1 in my book need a license am using avira free ver. I would love to have a new license, thanks. The best Antivirus solution I’ve met. I can use a free license! I am an eternal optimist so I am leaving a comment two days to late in the hope of winning a free lisence. I am using an old Kaspersky suite for protection and it’s really not working that well. I have wanted ESET security software since I read a positive review in a magazine in November. This sounds like a very practical prg. I use AVG and Super AntiSpyware. I am a person on limited income and have not been able to afford the expensive packages. NOD32 is a product that is highly recommended. I’d appreciate a licensed copy. great give away…. am currently using NOD32 Smart Security…..
After my Trial of Eset Nod32 AV expired, i switched over to Norton 2009 and there has been no looking back! They have hit a homerun with their 2009 AV. This is one off the best scanners. I use this one on the office, but also like to use it at home. It uses hardly any resources and is really fast…. I would love to get an official version. I’d like a shot at this too. Thanks! I also use AntiVir Free. Would be nice to win NOD32. Quem sabe pinta o nod prá mim. To house I use KIS 2009 on a laptop computer for internet but on the computer tower I don’t have any antiviruses and therefore I don’t connect me in internet. I would like to also try ESET NOD32 antivirus to try his/her efficenza against KIS 2009! I would want to be able to recommend the mile to my pupils of computer science antivirus on the market. I guess it’s too late , but trying is doing no harm ! I always wanted this NOD32 so…. Happy hollydays , and Merry Christmas from Jerusalem ! Happy Holidays to gHacks! I use AVG 8 Free on one notebook computer and Avast! Home on a much older notebook computer. I would love to have a license for NOD32. always been in love with this one, from day one! Wish I had known about this. Have tried most Av and settled on using the 30 day trial of NOD32. Would love to not have to download and install every month :) Great product – super detection, light on resources! I’m using Webroot Antispyware/antivirus. the newer version crashes on Windows Vista, I had to go back to version 5 something to get it to work. I would love to have NOD32. I hear it’s what all the hackers use t5o prtect their computers. I´m using Avira AntiVir free edition. I´ve always heard about ESET´s effectiveness and I´d love to have it in my Vista. Hi, I would love to have nod32 for christmas. I currently use avast and it misses alot of stuff! I understand this is one of the best anti-virus programs out there. I am currently using the free version of Avira and would love to have this addition/replacement. Thanks in advance. Apart from being a superb anti-virus program, NOD can often be run in conjunction with other anti-virus programs and this is a huge plus because, no matter how good an anti-virus program is, no single program can catch all the malware on the Internet. So, I would really like to win one of the five licenses. No antivirus program running, due to previous experiences with McAfee/Norton AntiVirus programs. Would like to give NOD32 a try. Please provide me a copy of NOD32. This would be an awesome program to get. PLZ I NEED AN ANTIVIRUS! Hi I always heard so many things about it. I would love to have one license to use it. Count me also , please. What an opportunity! I’m using Kaspersky since many years, but this version is impossible, at least on my system. The on demand scan slows the computer so much down, that it even takes some minutes to stop the scan, the system is nearly not responsive at all. I experienced NOD32 on my friend’s computer, and want to change as soon as possible. So, I would be really happy, if I would get a license. Please consider me also for this offer. I’m not using anuthing right now, but I’ve heard good things about nod32. I use Avast Internet Security. Please consider me for a license for NOD 32 Antivirus, if i am not too late. I have been using AVG free version. It has been quite useful, but maybe it could be upgraded.